Meet 63 Roebling, AKA 229 N. 8th Street, which is the former site of the Tribeca Bakery and part of what we call Williamsburg's N. 8th Street Corridor because of the number on demolition sites, construction projects and buildings for sale. (The corridor runs from Meeker Avenue and the BQE to Bedford Avenue.) 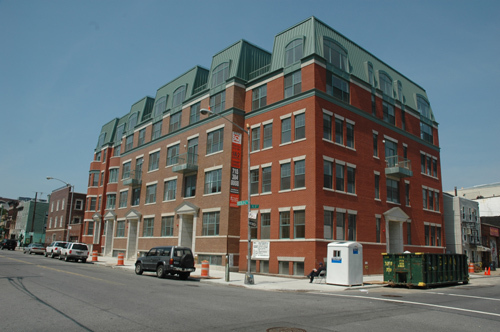 This six-story building is another Karl Fischer, diagonally across from the Karl Fischer at 80 Roebling (Roebling Sq., below), making for what we'll call Karl Fischer Corner from which can be seen Karl Fischer Row itself on Bayard Street along McCarren Park. The building is being developed by Roebling Park LLC, so we're guessing it will be the Roebling Park. 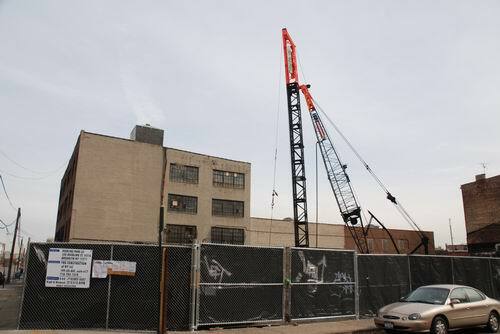 The crane banging away at the site is the same one noted on N. 10th Street and parked at the Roebling Oil Field. We never thought we'd live to see the day when we'd recognize cranes, but it has come to pass. All we can say is, this bad boy gets around. Former ESDC Chair Gargano Being Audited?